Escitalopram reduces inflammation in depression and potentially reduces neurotoxicity according to an article just published in the Journal of Psychiatric Research . A pro-inflammatory tendence has previously been noted in patients with depression, and this seems to be associated strongly with increases in kynurenine (see below for more information on how exercise counteracts this tendency). Kynurenine is the first step in the degradation of tryptophan (see image at right). Alterations in the kynurenine to tryptophan ratio have been reported in a number of diseases including lupus, multiple sclerosis and depression. 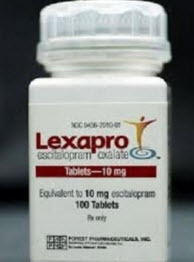 This study looked at how treatment with escitalopram (Lexapro) affected the elevated levels of inflammation associated with depression. The study found that, at least in the short run, inflammation was present and tended to persist in patients with depression who were successfully treated, however there were improvements in the neurotoxic metabolites of the tryptophan/kyurenine pathway. Baseline plasma concentrations of hsCRP [high sensitivity C Reactive Protein], TNFa [Tumor Necrosis Factor alpha], IL6 [Interleukin 6] and MCP-1 [Monocyte Chemoattractant Protein] were significantly higher in patients compared to healthy controls… During escitalopram treatment concentrations of inflammatory biomarkers did not change except for TNFa that trended lower. 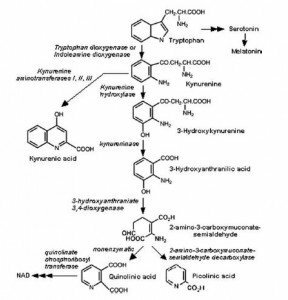 Metabolites and ratios of the tryptophan/kynurenine pathway showed reductions of the neurotoxic metabolites, 3-hydroxykynurenine and quinolinic acid, 3-hydroxykynurenine/kynurenine, quinolinic acid/tryptophan, kynurenic acid/quinolinic acid and quinolinic acid/3-hydroxykynurenine. Exercise and Stress – A discussion about how exercise reduces inflammation via a reduction in kynurenine mediated by increased production of PGC-1 alpha. Simple Test May Predict Which Antidepressant Will Work – Curiously, in this study higher C Reactive Protein (CRP) – which is a marker of inflammation- seemed to predict a better response to nortryptiline than to escitalopram.